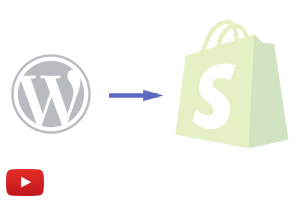 This video tutorial shows you step by step instructions how to migrate your Blog Posts (Articles) from WordPress to Shopify Blogs. Go to your WordPress site, and install the Plugin: All Export. Export all your WordPress blog posts using “All Export” plugin to the CSV file. Open the CSV file, save it as Excel file. Rename the Excel file sheet (tab) to “Blog Posts” so that the Excelify app knows what’s inside that sheet. Set the column titles of the columns you want to import – copy column names from the Excelify template file. Import the new Excel file to Shopify using the Excelify app. Upload the image files to your Settings -> Files section in Admin. Change image URLs in your Body HTML to point to your uploaded images. In Excel: use Find-Replace with * to replace URLs with the variable path, and keep the image file names unchanged. In Google Sheets: use the =REGEXREPLACE function to change URLs. If you can’t change those URLs yourself, please, ask our Support, we will do that for you.